Our large-format printing (LFP) products are nothing less than great! Available on a wide range of materials, they include the right solution for virtually any occasion. Go for a format that really attracts attention and optimally delivers your message! 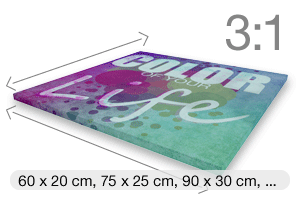 Let us put your favourite picture on a large cotton canvas! Whether it’s a photograph or a graphic, with our help you can turn it into a real work of art. It’s a great way for you to make a lasting impression – and guaranteed to attract attention! If you’d like to turn a photographic memento of your last holiday or your favourite picture into something really special, our canvases are the ideal way to do it. You can even order them in very small quantities starting at just one for use as frameless eye-catchers. An optional saw tooth hanger lets you easily mount it wherever you like. We produce our canvases with artful precision, taking painstaking care to print everything to your complete satisfaction. To ensure this, we check your data a total of five times while processing and producing your order. The materials we use come from selected premium suppliers and we always monitor their quality to make sure it is first-rate. We use cotton fabric with a weight of 410 grams per square metre for our canvases. Your image is printed on a digital press using latex inks for the best possible results. So your canvas will look like real art and can be hung up with ease, the canvas is mounted on a stretcher frame 1.8cm thick. Ready-to-go for mounting wherever you want to display it, for example with our saw tooth hanger. Single Copy or Limited Edition? 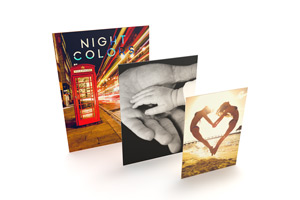 We produce our canvases in runs as small as a single print, if you want your favourite image to be one-of-a-kind. Or if you’re planning to share it with friends, colleagues or family, you also have the option of ordering up to 25 copies. While artists labour for weeks or even months to put the finishing touches on their masterpieces, we work a bit quicker than that. We’ll produce and deliver your personalised canvas within five to six working days within the scope of our standard service. Or if you’re in an even bigger hurry to put your work of art up on the wall, you can also opt for express delivery and receive it in just three or four working days. 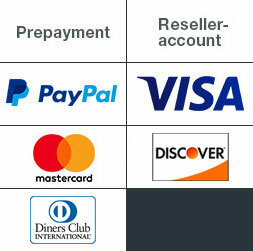 Explore the wide range of print products available from PrintCarrier.com! All of our topics at a glance: Product Group Large Format Printing, Acrylic Glass, Aluminium bonded panel, Floor graphic, Handmade paper, Wallpaper, Hard foam (PVC), Katz Display Boards, Canvas on wooden frame (thickness 1.8 cm), Re-Board, Static adhesive PVC foil.